Posted September 26, 2014 by Heather Michet & filed under DIY, Food, Recipes. After you’ve enjoyed their health-giving goodness during growing season, make up these pickles with the remaining abundant harvest to carry your cucumber memories forward throughout the coming year – until next year’s crop is ready to bless you. Wash cucumbers. Quarter them or cut into thick slices. 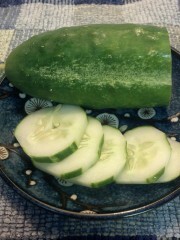 Combine with salt and water in large glass or ceramic bowl so that all cukes are covered with brine solution. Let stand 5 hours then drain and rinse thoroughly. 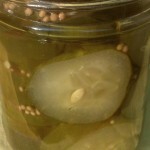 Pack the cucumbers into clean jars to within 1/2 inch from tops. Mix remaining ingredients in a pan, heat to a boil, and pour over the packed cucumbers. Release any air bubbles by inserting chopstick or thin knife along inside of jar, being careful not to poke or cut cucumbers. Complete seals and process for 5 minutes in a boiling-water bath. *The amount of curry and honey may be adjusted to your taste. Enjoy these with your favorite sandwich (tuna salad is the best), on a veggie platter or diced in egg salad. I’m glad you got pickles ‘put up’, Kathy. Thank you for reading. To next year’s harvest & preserving!